A homage to John Cage prepared piano by Lochaber High School S3 Music class; applying new and experimental ideas and methods to music, art and technology. Tickets are free and can be collected from Lochaber High School Office. In May/June 2016 Room 13 Artist in Residence Audrey O’ Brien introduced Mr Young’s S3 Music class to an electronic tool called a touch board – this allows any surface to connect to the digital world by conductive material or electronic paint. This short documentary film is a collage of the pupils work: pictures and film documenting the four week project; sound from field recordings and voice recordings; shaped objects and drawings and artist in residence pictures and sound for the film. The film focuses on an interactive artwork which took place on the final class with the pupils. The word ‘Poi’ comes from a tradition of performance art using voice, music, objects and dance (originated from New Zealand). It also means object manipulation and is used here as a symbol of young people shaping and constructing their own learning. This project was made possible with project funding made available to Room 13 a partner in Highland Youth Arts Hub and supported by Creative Scotland’s Time to Shine initiative. 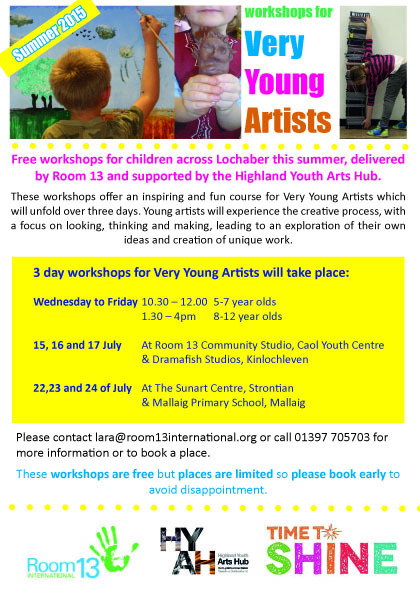 Contact us for bookings & information about Very Young Artists workshops and our Highland Youth Arts Hub programme.